One of the top 10 Paris attractions, The Louvre Museum (Paris) is in fact the largest art museum in the world and the home for one of the finest art collections anywhere to be seen including two of the most famous painted woman – the Mona Lisa and Venus de Milo just to name two out of the 30,000 exhibits displayed in the Louvre Museum. 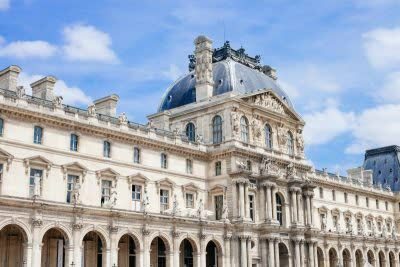 Carefully planning of the tour in the Louvre Museum is important and will help you make the most out of it rather than making your way through the crowds, coming out tired and most probably disappointed. Remember that this gigantic museum stretches for almost half a mile (750 meters). Our best advice for the first time visitor would be – decide upfront what are the works that you must see, go for those and then settle in one of the sections for a pleasant stroll through the works of art and historical artifacts. It was François the first and Louis the 14th who purchased most of these paintings and sculptures while the rest were contributed or purchased (and in many cases simply taken) by Napoleon later to be returned to the original owner’s family. The most famous smile in the world, better known as the Mona Lisa, was ordered by François I from Leonardo the Vinci. It gained most of glory after it was stolen in 1911 by a Louvre employee, who simply left the building with the painting under his coat. The entrance to the Louvre Museum Paris is a glass pyramid, one of the city’s most distinct symbols and what has become a tourist attraction by itself as no photo album of Paris seems to be complete without it. Notice the contrast between the modern glass structure and the classic interiors and how well the natural light flows in through the huge geometrically designed glass. There are seven sub-galleries in the Louvre Museum distinctly defined by their content. The first hold some of the most important antiques from the ancient Egyptian world.